Their first communion is a very special day for a child. As a part of the celebration the parents of the child or the child themselves may wish to make a speech. This is a guide about first communion speech ideas. I have be asked to raise a toast for my godchild's First Holy Communion and I'm completely tongue tied. Please help me. Thanks. Oliver, you don't say whether this godchild is male or female. Either way, you know the child best. My advice? Keep it simple, short and sweet. Maybe something like "To (insert child's name.) (Insert a one-sentence observation about the child here.) May God richly bless you in all your endeavors as you learn and grow in His grace." Sorry if this isn't in the right format, I'm not a Catholic. You could also do a search for "First Communion Toast" and see what pops up. I agree, it's a holy day and a blessing would be better. I blessed my godson with a blessing based on his personality related to Bible men. Example: May you be like Joseph, who trusted and obeyed God even when it was difficult. Print it out and give him a vision and goal of what he can be for God (or she, as the case may be). Please give me some ideas for a thanksgiving speech for the occasion of my child's first holy communion. You should thank everyone who has helped prepare your child for this blessed event, and who helped your child deepen his or her faith. Also thank people who have loved your child and made his life joyful. "It is a real pleasure to have you all here to celebrate this occasion." "Today is a day (child) will cherish and remember for the rest of (his/her) life." "Words cannot express how grateful we are to have such loving friends and family to support and encourage (child) as (he/she) continues (his/her) journey of faith." Can you please provide me with ideas for the First Holy Communion speech for my daughter? First Communion brings happiness, stress, and speeches. Congrats to your daughter! An idea is to talk about what she learned and how fun it is and how she has become a very holy person. She can talk about how excited she is and how much she wants to share her excitement. She can also praise her teachers for their help, and praise God for helping her through the process of First Communion! Hope this helps! Good luck to your daughter and family. Please give me a thanksgiving speech for the occasion of my child's first holy communion. I am looking for help with an introduction speech, toast, and thanksgiving. A very good evening/morning/afternoon to one and all present here . on behalf of my family , I'd like to thank all of you for accepting our invitation . It is a real pleasure to have you all here to celebrate this occasion . Today is a day ( CHILD ) will cherish and remember for the rest of his/her life . Words are not enough to express how grateful we are to have such loving friends and family to support and encourage (CHILD) as he/she continues his/her journey of faith . I am looking for a speech for my First Holy Communion. Any ideas? Wow, things sure have changed since my first communion almost fifty years ago. We accepted our first wafer with humility and personal thanks by talking to Christ in our own hearts, crossed ourselves, and genuflected before walking away from the alter. "I would like to propose a toast to my dear godchild Jay. Let me start by thanking all our guests for making it to share in this very important occasion in our lives, the FHC of Jay. Today is a day Jay will cherish and remember for the rest of his life. It is a day when we all celebrate Jay's commitment to our Christian faith in the presence of those who care most about him. Belief in the real presence of Jesus in the Holy Eucharist is one of the pillars of Catholicism. When the priest utters the words of consecration over the bread and wine, it is transformed in substance (though not in form) into the very body and blood of our Lord and Saviour Jesus Christ, who died on the cross for our sins. That is why it is considered a great grace and honour to partake of the Eucharistic Communion. I need a speech for my son's 1st Holy communion. Carol and I would like to propose a toast to our Darling Daughter RHEA. Let me start by thanking all our guests for making it to share in this very important occasion in our lives, the FHC of our lovely daughter, Rhea. Rhea has waited a long time for this day, today is one day Rhea will cherish and remember for the rest of her life. It is a day when we all celebrate Rhea's commitment to our Christian Faith in the presence of those who care most about her. Rhea, you were a beautiful baby: cuddly and adorable, always longing for the safety of our arms and dependent on your parents for almost everything. As you grew, we were there and recorded every special occasion in our hearts. The time you started to crawl, that very first step, your first tooth and the very first time you had a haircut. As time passed, before we knew it, you had grown up. You had grown more beautiful and a little less dependent on us. All these things we stored away in our memory. Thank you, sweet Rhea, for eight years of love, joy, memories, and laughter! You are truly a blessing from God, and we are so happy that you are our child! We couldn't have asked for a more loving and compassionate young daughter! You are our angel, and we love you so much, much more than words can ever say! 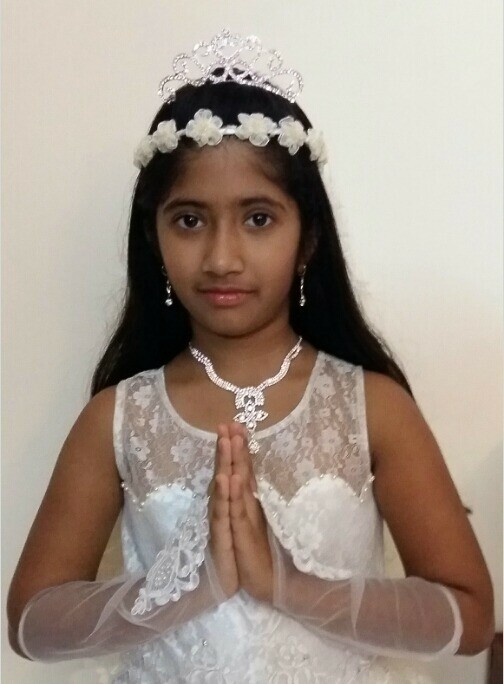 So let us congratulate Rhea on this very special day, when she has received our Lord for the first time in communion and let us wish her all happiness in her Christian life from this day forward. Ladies and gentlemen, please rise and join me in drinking a toast to Rhea. Hope you all have a great time. We love you, Pups! God bless you mightily, Sweetie! Congratulations on the most sacred of new beginnings! You might want to bring in the idea of Popeye and the Spinach which gives him strength. For us as Christians the "Spinach" which gives us strength is the Body of Christ. By Fr. Errol Fernandes s.j.